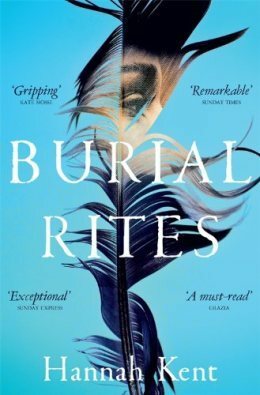 This week’s first paragraph is from Burial Rites by Hannah Kent. They said I must die. They said that I stole the breath from men, and now they must steal mine. I imagine, then, that we are all candle flames, greasy-bright, fluttering in the darkness and the howl of the wind, and in the stillness of the room I hear footsteps, awful coming footsteps, coming to blow me out and send my life up away from me in a grey wreath of smoke. I will vanish into the air and the night. They will blow us all out, one by one, until it is only their own light by which they see themselves. Where will I be then? Northern Iceland, 1829. A woman condemned to death for murdering her lover. A family forced to take her in. A priest tasked with absolving her. But all is not as it seems, and time is running out: winter is coming, and with it the execution date. Only she can know the truth. This is Agnes’s story. A while ago I noticed that people were reading this book when it was shortlisted for many awards, but although it’s historical fiction, one of my favourite genres, and based on a true story it didn’t really appeal to me at the time. Then I read Hannah Kent’s second novel, The Good People, which I thought was such a beautifully written and moving book, and I decided to try her debut novel. What do you think? Would you keep reading? And if you have read it what did you think about it? I love this introduction. It isn’t a book I’ve heard of before but I would definitely keep reading. Glad I’m not the only one who hasn’t read it! I’m so glad you featured this one, Margaret. I thought it was an excellent read. I liked the setting, the context, the whole thing. I hope you will, too. That’s good to know, Margot, thanks. I loved this book, and still think it should have been shortlisted for the Booker – enjoy! I have mixed feelings about the Booker prize, some books that I think are great just don’t listed! Glad you enjoyed it!! This is a book I always wanted to try but, never have. Hope you like it. I have yet to get to this one. I picked it up because it was a debut book. Hope it is a great read for you. I really like that opening! I can see myself getting lost in the language or Burial Rites. I have heard great things about this one, but haven’t read it myself yet. I’ve heard about this book, and it looks like something I’d enjoy. I like the opening. I’d keep reading! This is a brilliant opening to a superb book – I thought I was one of the last people on the planet to read it so I’m secretly pleased I beat you to it! Enjoy but have the hankies ready! This is a new one for me, but I am amazed at the opening paragraph. I’d love to read it.